One advantage of the balance exercises on the Fitter is that the more balance you have, the more options you have for dealing with the little-unexpected things that come up while you’re out exercising on skis. You don’t have to learn the “whole thing” to get that benefit: even a little balance on one ski helps, and more helps more in London. Follow these simple exercises and you will not only improve your technique and fitness but greatly reduce the risk of knee and back injury. STEP ONE: Lower leg exercises to correct ankle flexibility. Most skiers flex their knees more than their ankles. STEP TWO: Upper leg exercises to correct skiing symmetry. ski Fitness Training program for Skiers in London Working on new techniques can help you stay motivated rather than bored, and it gives you something else to talk about with other skiers. 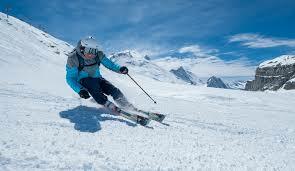 Downhill skiing and snowboarding require specific preparations and conditioning routines to ensure safe winter fun. Strength, flexibility, endurance and skills exercises for skiers and boarders are essential for both recreational and expert skiers. Most skiers return to the slopes after months away. Some participate in other sports during the off-season to stay in shape, but many are weekend warriors. No matter where you are fit or not, you could wind up with minor aches, pains or a serious injury if you don’t spend a little time preparing. Skiing and boarding require technical and physical skills; including strength, endurance, and balance to master the slopes. Scott will do a deep 4-hour assessment of your posture core back pain and your diet and lifestyle to make sure you are ready for the slopes. getting you fitter in 12-week programme, train 3 days a week. for 24 weeks in London to get you ready for Jan 2019 skiing fitness ski holiday don’t leave it too late or may get injured because of you not conditioned yourself in time but with Scott 18 years of experience of over 18 years to get you ready for anything your ski holiday may bring you. I have been training with Scott since January after fractured rib whilst skiing. As result I have completely renovated my diet, training program and lifestyle for the better, I am stronger, leaner and have more energy and more downtime, with less stress. Highly recommended.